The muscle uses a revolutionary material that fluidly changes its properties. Scientists at US Department of Energy's Lawrence Berkeley National Laboratory have created a new kind of robotic muscle, that they claim is up to 1,000 times stronger than normal human muscle. The muscle uses vanadium dioxide, a revolutionary material that fluidly changes its shape and structure whenever differing amounts of heat are applied to it. If this guy was the first thing to pop into your head after reading that last sentence... you're not alone. "Robot muscle 1,000x human strength" sounds like something straight out of a Terminator movie, but this is a very real thing that could have a far-reaching impact on the field of robotics. 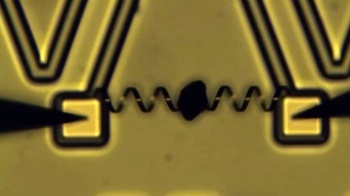 When made into a robotic muscle, scientists believe that the new material will be able to hurl objects 50 times it weight and five times its length in as little as 60 milliseconds. Junqiao Wu, Team Leader on the project, describes it as a "micro-bimorph dual coil that functions as a powerful torsional muscle, driven thermally or electro-thermally by the phase transition of vanadium dioxide." "Miniaturizing rotary motors is important for integrated micro-systems and has been intensively pursued over the past decades," Wu explained. "The power density of our micro-muscle in combination with its multi-functionality distinguishes it from all current macro- or micro-torsional actuators/motors." This kind of breakthrough opens doors for scientific progress being made exponentially, as these new robotic micro-muscles could potentially be used to build even smaller and more complex organisms. 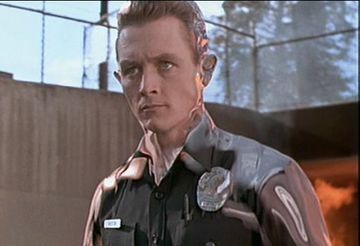 Now that we have robot muscles and artificial hearts, how long will it be before I can go full Deus Ex-style cyborg?